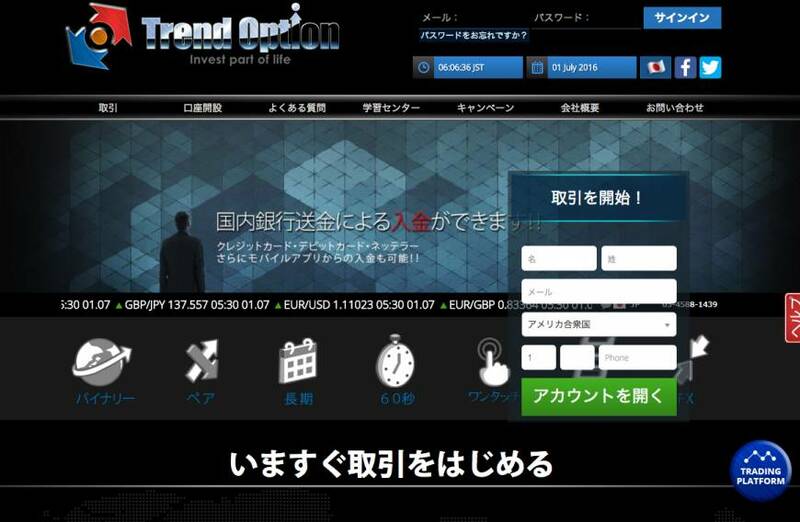 A screenshot from trend-option.com, a binary option website previously operated by Entserv Asia Ltd.
A paper trail that runs from Okinawa to Canada and from Israel to Italy and France links some unauthorized online traders on the blacklist of Japan’s financial regulator to offshore companies in tax havens, an analysis of files leaked from a Panamanian law firm has revealed. The documents are part of the Panama Papers, a cache of 11.5 million files obtained by the German newspaper Suddeutsche Zeitung and shared with the International Consortium of Investigative Journalists and their media partners. The companies found in the Panama Papers operated websites that were used to invest in binary options, a fast-growing sector in the online trading industry where investors bet on the market. Those who use internet-based platforms set up an account with the site operator and place money on the prediction that the price of a financial asset will go up or down. They make a profit if the prediction is correct and the transaction may last just a few minutes. The whole operation can be repeated more than a hundred times a day and its simplicity attracts also users with little financial knowledge who wish to double their savings in a short amount of time. The average binary options investor is a male company employee in his 20s or 30s who comes across blogs and bulletin boards advertising easy systems to make money, the spokesman added. The center estimates that in 2014, when the number of Japanese binary options investors began to increase, related complaints rose 90 times compared with the previous year. Investors typically complain that they can’t get in touch with the platform operator after they transfer the initial deposit or are asked to pay hundreds of thousands of yen to only cancel the contract. Often, behind the websites are expert traders who have dropped out of the financial sector and provide their services under a different name, said Tetsuro Arai, a lawyer who represents victims of investment fraud. The Japan Times checked the addresses of the internet-based binary options platform operators as reported on the government’s list. About half of the companies were located overseas in countries like Belize, Seychelles and the British Virgin Islands. 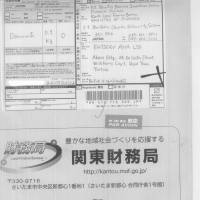 Those found in the Panama Papers had Japanese websites but reported addresses that were sometimes shared with other companies in other countries. Only after reviewing dozens of internal emails, incorporation records and identification documents contained in the Panama Papers, The Japan Times was able to ascertain the identity of their shareholders. The confidential documents were leaked from Mossack Fonseca, the law firm at the center of the Panama Papers investigation, that in the past four decades has registered more than 200,000 offshore companies for clients from all over the world. It is also the former operator of trend-option.com, according to the FSA. Over the years Entserv Asia has had a number of different shareholders. One of these is another British Virgin Islands company named Intertainment Asia Inc. Its shareholders are Carl Wahlin, a Swedish national with experience in the Asian gaming business, and KAYA88 International Ltd., a BVI firm directed by Hiroyuki Kato, a young entrepreneur who reportedly moved to Okinawa after making a fortune through affiliates, or websites that advertise gaming and gambling sites. In 2014 the shares of Intertainment Asia were transferred to Dumarca Holdings, a Maltese company. That year Intertain Group, a Canadian publicly held gaming company, bought out Dumarca and now also lists Intertainment Asia and Entserv Asia as its subsidiaries. The leaked documents show that Entserv Asia’s address was the same as its registered agent’s, Mossack Fonseca, in the British Virgin Islands. 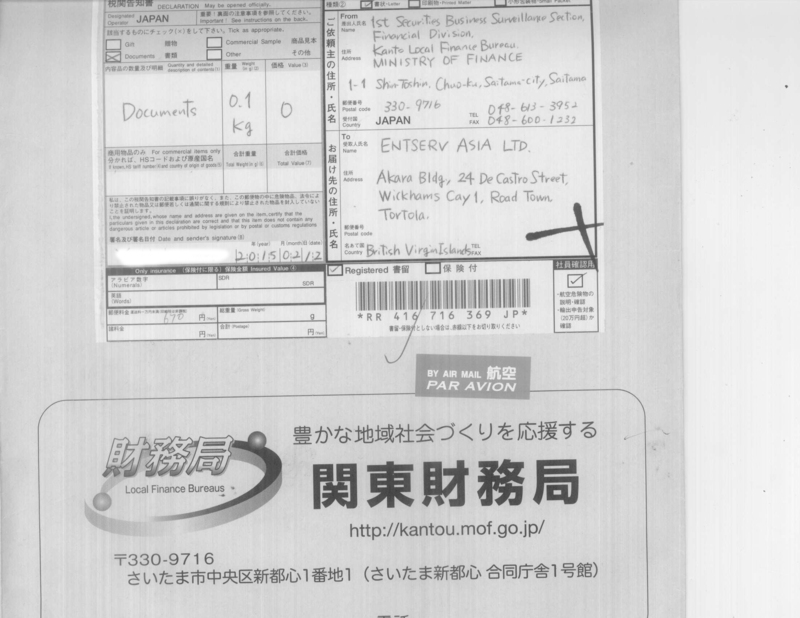 It is to that address that in February 2015 the Kanto Finance Bureau sent an envelope that contained the warning letter alleging the company was “soliciting over-the-counter derivative transactions on the internet.” The bureau employee in charge of the case confirmed the content. Intertain’s representatives and Wahlin did not respond to requests for comment. Kato could not be reached for comment. More than a year after that warning, the website trend-option.com is still running but is currently managed by a Marshall Islands-based company, which does not appear to be connected to any firm included in the Panama Papers. Today Entserv Asia is the managing company of the gaming website Dora Mahjong, while Intertainment Asia runs Samuraiclick, a website that advertises a number of gaming sites and two binary option websites, including trend-option.com. The Japan Times investigation also found that some brokers operate in multiple languages in order to target a larger number of customers. In one case, a binary options trader who received a €5,000 ($5,500) fine for running an Italian website without a permit registered a company in the British Virgin Islands and used it to manage an unauthorized Japanese binary options website. The site eventually ended up on the FSA’s blacklist as well. Reached by The Japan Times, the company’s director, Ron Benvenisti, declined to comment. Most countries require financial companies to have country-specific licenses in order to offer services, regardless or whether they have authorization in other jurisdictions. Although not all unregistered companies have fraudulent purposes, a number of international regulatory agencies continue to alert investors that some internet-based trading platforms may be engaging in illegal activity. But proving fraud is not easy, said Gabriele Giambrone, an international lawyer now representing 2,500 alleged victims of binary options fraud in a lawsuit against some Israeli operators. “It is necessary to analyze market trends, the way the platform works as well as statistics on financial losses compared with the transaction that the investor carried out,” Giambrone said. If the company was incorporated in a tax haven, tracking down the platform operators may be even more complex, he added. Today, Japan is one of the world’s largest markets for binary options, with trading volume of ¥30.4 billion ($300 million) in May, according to the latest estimates by the Financial Futures Association of Japan. Experts attribute the increase to many Japanese people’s interest in easy ways of betting and in the “novelty” of binary options rather than to recent trends in the global economy. The number of investors is expected to grow and so is the number of frauds. Prosecution remains difficult. There is a problem in Japan in that, even when authorities manage to bring action against an alleged scammer, they rarely show up in court and the case ends there, said Arai. “So far there hasn’t been any satisfactory judgment in a case of binary options fraud,” he said. The Consumer Affairs Agency tries to collaborate with its peers in the United States, Canada, South Korea and other countries, and unauthorized brokers can be punished with fines of up to ¥5 million ($48,400). But investors can do little to protect themselves against binary options fraud. Their best bet at this point is to check on the government’s list to make sure their broker is licensed. Scilla Alecci and Alessia Cerantola are members of the Japanese reporting team that collaborates with the International Consortium of Investigative Journalists, the Suddeutsche Zeitung and their media partners on the Panama Papers investigation. Both have covered Japan and Asia-Pacific affairs for almost a decade.